Transcriptomes is referred to an entire set of transcripts and their number present in a cell at a particular developmental phase or physiological state. Study of the transcriptome is necessary to identify different genes and their functions, and elucidating various signalling pathways. The key intend of transcriptomics is to index all sort of transcripts (coding and non-coding RNAs) to establish the transcriptional organization of genes. Genes act as blueprint whereas proteins act as a functional unit of cell that is regulated by gene expression/repression. Proteomics is a broad scale analysis of a complete set of proteins (proteome) in a cell, tissue or organ at a particular time. As proteins are final product of a gene they are closer to the function as compared to genes. Hence, this “omics” study will facilitate more rapid advancement in understanding of different biochemical pathways of plants. 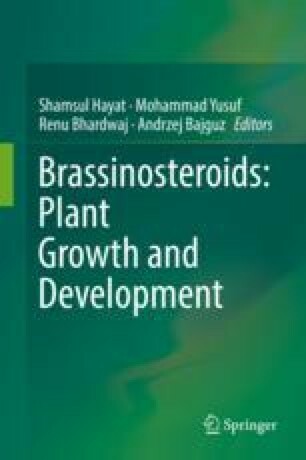 Brassinosteroids (BRs), a class of plant hormone regulates various developmental and physiological processes. This chapter deal with the application of transcriptomics and proteomics to elucidate the hormonal targets for growth and development of plants.